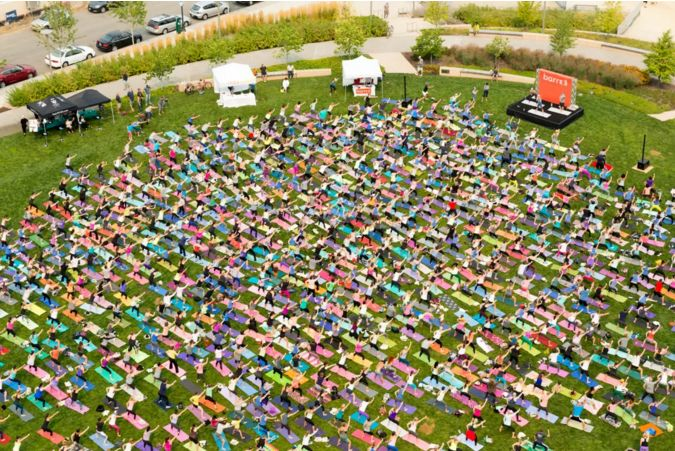 Brides and grooms looking to get fit before the big day, take note: Barre3 in the Park is back and better than ever. The annual bonanza returns to the Pearl District’s Fields Park on Saturday, August 20, to celebrate the eighth anniversary of the Portland-born boutique fitness brand. Founded by wellness expert Sadie Lincoln in 2008, Barre3 has blossomed from a single Pearl District studio to nearly 100 locations across the United States, the Philippines, and Canada. Named after the company’s three “pillars”—exercising, nourishing, and connecting—Barre3’s hybrid technique combines elements of yoga, Pilates, and ballet into a low-impact, full body workout. Not 100 percent sure what that means? No worries. Invite your betrothed or your bridesmaids to try the popular fitness class at the fourth annual Barre3 in the Park event. Registration for this free workout begins at 10 a.m. Be sure to arrive early for a good spot—more than 1,300 folks are expected to participate, and the first 500 attendees will score free tote bags and studio class cards. Park little ones in the B3 Kids corner, which offers children’s activities and an onsite photo booth, and buy a few raffle tickets to benefit Girls, Inc. before class begins. Lincoln herself will teach the class from 11 a.m.–noon, followed by a restorative stretch led by Barre3 master trainers. Once you’ve stretched and strengthened to your heart’s content, refuel with snacks provided by local brands Betsy’s Bars, Crisp NW, Tea Bar, Greenleaf Juice, and Brew Dr. Kombucha. Maybe you’ll become a Barre3 convert by the end of the event, or maybe you’ll never set foot in a studio… either way, with a price like this, what have you got to lose?